That’s because most major European nations are less interested in squeezing Iran than in trying to save the 2015 nuclear deal from which the U.S. withdrew last May. Only a few weeks after the Warsaw conference was announced, the U.K., Germany and France unveiled a so-called special-purpose vehicle to let some businesses barter with Iran for humanitarian goods. 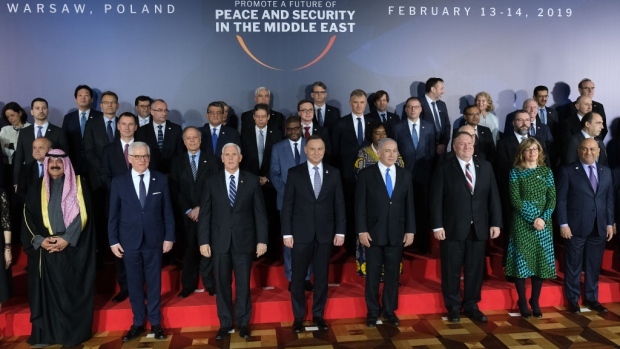 The message to Pompeo was clear: If you want Europeans at your conference, you can’t make it about putting the screws to Iran. So the State Department improvised. The conference now has something for everyone. U.K. Foreign Minister Jeremy Hunt has said he is looking forward to co-hosting a meeting with Pompeo and the foreign ministers from Saudi Arabia and the United Arab Emirates on the Yemen peace process. Jared Kushner will be briefing allies on the economic component of his plan for peace between Israel and the Palestinians. There will be breakout sessions on cybersecurity and Syria. Not everyone got the memo. Israeli Prime Minister Benjamin Netanyahu told his cabinet Sunday the first item on the agenda was Iran and how to prevent it from entrenching itself in Syria, continuing its regional aggression and attaining nuclear weapons. On Tuesday, apparently agreeing with Netanyahu’s description of the agenda, Iranian Foreign Minister Javad Zarif said the conference shows America’s “obsession” with his country. He predicted it would fail, saying that many delegations were forced by the U.S. to attend. The biggest event of the conference will be a private dinner Wednesday evening, with foreign ministers and other representatives from more than 60 countries. Netanyahu will be in a large dining hall with the foreign ministers of Saudi Arabia, the United Arab Emirates and other Arab states. Diplomatic toasts will be offered, and official photographs taken. Israel’s quiet relationship with its former regional rivals will become a little less so. U.S. officials also tell me they expect European and Middle Eastern allies to establish working groups to follow up on specific issues raised in the conference. Here, these officials say, the focus on Iran is unavoidable. Discussions about Syria, missiles or cybersecurity will inevitably include the destabilizing role played by Iran. What’s more, the moves from France, Germany and the U.K. to keep the Iranian nuclear deal on life support will almost certainly not deliver the financial windfall the Iranians say they deserve. The Iranian financial entity that would work with Europe on the “special purpose vehicle,” for example, must meet international anti-money laundering standards, something Iran’s banks have thus far failed to do. The Trump administration is also signaling that it plans to keep ratcheting up sanctions. On Monday Richard Goldberg, the national security council’s director for countering Iranian weapons of mass destruction, suggested that the U.S. would not renew the exemptions some countries have received for the secondary oil sanctions imposed in November. So far at least, America has been able to re-impose crippling sanctions on Iran without European cooperation. So maybe unity is not strictly necessary for American sanctions on Iran to bite. But the larger project — what Pompeo described last month as “the campaign to create a better world, to allow the Iranian people to have opportunity and democracy” — will require international unity, as with Venezuela. The absence of Iran on the conference’s official agenda is evidence of international disagreement. In that sense, the watering down of Warsaw is telling. Eli Lake is a Bloomberg Opinion columnist covering national security and foreign policy. He was the senior national security correspondent for the Daily Beast and covered national security and intelligence for the Washington Times, the New York Sun and UPI.